She told me she had been to several different physicians, tried different medications, ate different foods, exercised, and tried numerous other interventions that didn’t change they way she felt. She was told that her thyroid lab (TSH) was normal, that there wasn’t anything wrong with her thyroid, and they couldn’t find anything wrong. I can’t imagine knowing that something is wrong but the people who are supposed to be able to help can’t find the problem and can’t help. I believe that the thyroid is one of the primary organs involved in this scenario. The key to fixing the problem with thyroid dysfunction is to identify the specific problem in the first place. In order to understand how your labs can be ‘normal’ and you still feel bad AND why your doctor doesn’t check any further, you have to understand your thyroid and how it works. The thyroid gland is located in the front of the neck and is responsible for secreting appropriate amounts of thyroid hormones. The thyroid hormones have an effect on every cell in the human body and function as a gas pedal, so to speak, to increase or decrease the metabolic activity of the cells. 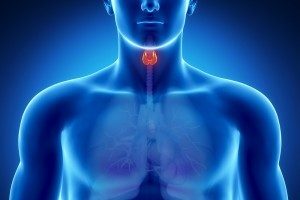 The thyroid gland releases primarily Thyroxine (T4) but does release a small amount of Triiodothyronine (T3). T4 has minimal physiologic effect and is converted to the much more metabolically active T3. The hypothalamus detects the amount of T4 circulating in the body and increases or decreases the amount of Thyroid Releasing Hormone (TRH) that is sent to the pituitary gland. The pituitary gland responds to the amount of TRH by releasing more or less Thyroid Stimulating Hormone (TSH). When T4 levels are detected as low, the pituitary sends more TSH to the thyroid to try to increase the amount of T4 release. Conversely, when T4 is elevated, the pituitary decreases TSH release so that T4 release will decrease. Therefore, the brain & pituitary gland are critical to the regulation of T4 release. Thyroid hormone released from the thyroid is transported on proteins in the blood. Most of this is Thyroid Binding Globulin (TBG). Hormones attached to proteins in the blood are in a constant state of flux meaning that they are constantly attaching and detaching. This is a good thing since only free hormone (unattached) is available for biologic activity. Therefore, the greater the quantity of TBG the less hormone is free. This means that increased levels of TBG can result in hypothyroid symptoms since less free hormone is able to interact with the thyroid receptors. As stated above, T4 has minimal metabolic activity and must be converted to T3. T3 binds to its receptor and exerts its metabolic effects. T4 has to be converted. The process of this conversion is imperfect and T4 can be converted to either T3 or Reverse T3 (RT3). The problem here is that RT3 is not only ineffective but also blocks the T3 receptor and prevents T3 from having its effect. There are several ‘patterns’ of thyroid dysfunction and they are treated based on fixing the cause the dysfunction. Interestingly, only one of these is treated with Synthroid. This is a problem of the thyroid gland simply not producing enough T4. The most common cause of Primary Hypothyroidism is Hashimoto’s Thyroiditis. This is an autoimmune condition where the body attacks itself causing decreased T4 release. The very first thing to do is to change to a completely Gluten-Free diet! In the event that your anti-thyroid antibody levels are normal then you may simply need synthetic T4 supplementation (synthroid). The pituitary isn’t working right for any number of reasons and isn’t sending TSH to stimulate the thyroid gland. This is often associated with adrenal issues from chronic stress and fatigue. T4 has to be converted to T3 but the process is disrupted for any number of reasons (see below). Elevated testosterone causes an increase in T4-T3 conversion. It also decreases TBG levels. This results in excess Free T3 stimulating the cells. Over time, this results in a resistance to T3 and hypothyroid symptoms due to this resistance. Increased estrogens cause an elevation of TBG. The more TBG, the less free hormone. The less free hormone, the less effect. Therefore, increased TBG causes hypothyroid symptoms. The treatment is centered around normalizing estrogen levels. Thyroid resistance occurs when the all of the appropriate labs have been obtained but the levels are normal. However, the patient STILL has the symptoms of hypothyroidism. Typically, this is due to increased stress which elevates cortisol levels. Elevated cortisol can make the cells resistant to the thyroid hormones. There are numerous factors that can alter the conversion of T4 to T3. The problem with conversion of T4 to RT3 is twofold. First, it consumes too much of the T4 and makes a substance that has no thyroid effect (RT3). Second, the RT3 blocks the thyroid receptor as previously stated. Since the problem here is that we are making too much RT3 from T4, giving more T4 can actually make the problem worse! I usually recommend stopping all T4 supplementation (including Armour thyroid) and then start working on why RT3 is being over produced. There may be a problem with TSH &/or T4 on labs but they may be normal. You have have symptoms of thyroid problems and go to your doctor to have a ‘thyroid’ test performed. If your TSH is high, you will undoubtedly be started on Synthroid or equivalent. You may even have your labs return to normal but we certainly haven’t ‘fixed’ the problem! THAN MEANS YOU PROBABLY WON’T FEEL NORMAL! Remember, the key to addressing the problem is to identify the problem and customize the treatment for each patient based on what is wrong. Synthetic T4 is an appropriate medication in some cases, no question. My experience has been that thyroid problems have been inadequately worked up and so the appropriate diagnosis cannot be made. Without an accurate diagnosis, the correct treatment cannot be instituted. Without correct treatment you will probably never feel normal. Obtain a FULL thyroid evaluation based on a thorough history and physical exam. Again, we have to get all of the appropriate labs. Give medications based on the exact thyroid problem: T4 only, combination T4/T3 medications (Armour), T3 only (Cytomel, short-acting T3, Compounded long-acting T3). Improve overall health using the ‘Healthy Trinity‘ approach. Eat a gluten-free diet to minimize any chances of autoimmune thyroid problems. Rule-out adrenal dysfunction with an Adrenal Stress Index. Ensure adequate amounts of Sleep, Recovery from your exercise, and Reduce stress. I hope this information helps you to understand the issues with the thyroid gland and HOW it can malfunction as well as appropriate treatment to improve your overall health.